Our entire house is currently undergoing a MAJOR deep clean (for reasons I’ll share very very soon!). I try to keep on top of the cleaning as best I can but in all honesty I hate it. I’m so NOT a domestic cleaning goddess. So, more often than not, I let it slide which then results in waaay more work to get it clean again. Not fun. This week I’m trying to be organized and clean a room a day. The first space I tackled was the bathroom. Now, on the surface it looks OK but it hasn’t had a real deeeeep clean in a couple of months. When I need to tackle a major cleaning the first thing I always do is stock up on products . Right now, Dollar General is doing some great deals on Scrubbing Bubbles® products so I headed there to pick some up! 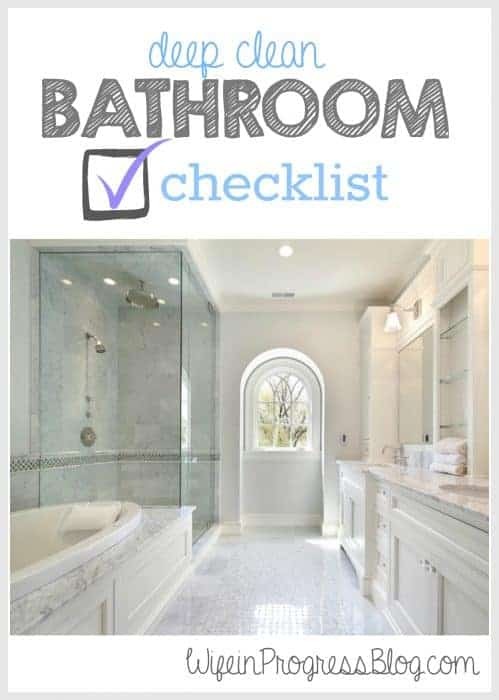 Clear off all surfaces and place items outside the bathroom. Remove towels, shower curtains and bath mats. Launder together on a cold wash with regular detergent. Dust baseboards, light fixtures and fans. Gather your cleaning supplies: sponges, gloves, bathroom cleaner (I love the Scrubbing Bubbles®), toilet cleaner, plastic baggy, and microfiber cloth). Open up windows to ventilate the room. Toilet: Pour toilet bowl cleaner in and scrub with a stiff-bristled brush. Make sure to get under the rim. Flush. Pour more cleaner into the bowl, close the lid and let it sit for 15 minutes. After that time you will flush again. 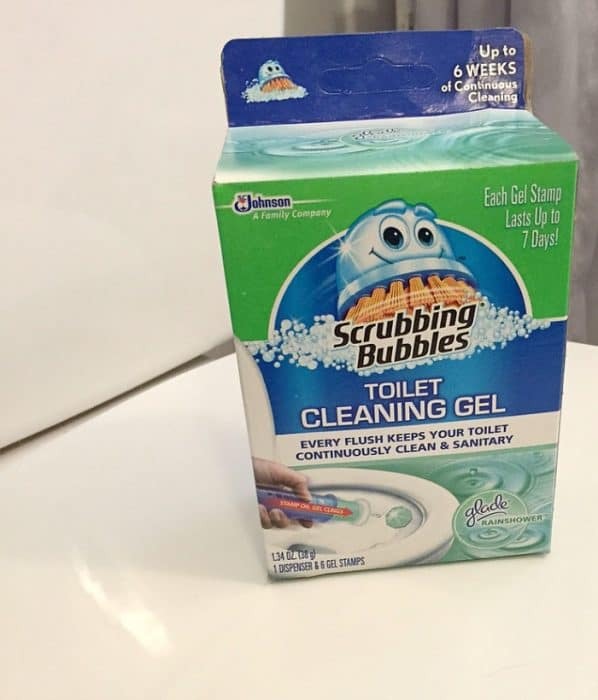 I love to use the Scrubbing Bubbles® Toilet Cleaning Gel under the rim to keep my toilet clean 24/7 for up to 7 days. Next, wipe down the outside of the toilet with a product such as Disinfectant Scrubbing Bubbles® Bathroom Cleaner. You can turn the canister upside down and it will still work – handy for those various bends that tend to build up dust. Make sure you do the ENTIRE outside part. Rinse clean with a wet sponge. Bath: Here you’ll want to use a multi-surface bathroom cleaner that removes soap-scum. 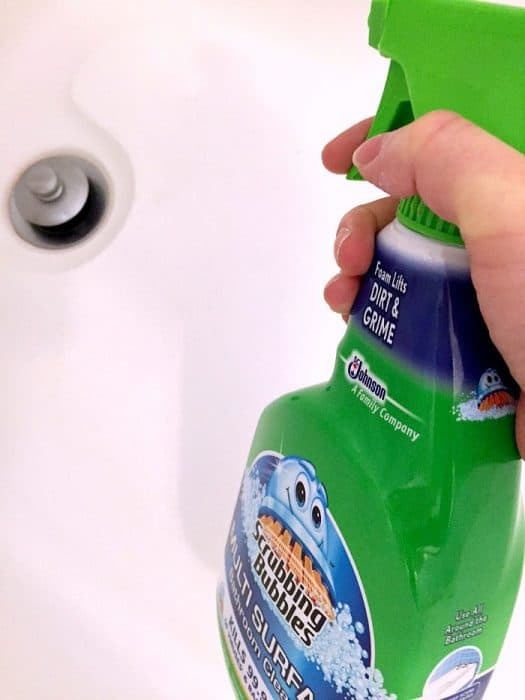 The Scrubbing Bubbles® Multi-Surface Bathroom Cleaner is perfect for this. Allow the product to penetrate the soil. Then, using a wet sponge, wipe the tub until you can run your hand along the side and not feel the buildup. Shower Stall: Again, the same multi-surface cleaner will work here. Rinse and buff with a microfiber cloth. Sink: Using a cleaner such as the Disinfectant Scrubbing Bubbles® Bathroom Cleaner, wipe down the entire sink area including the faucet. Ensure that the area at the base of the faucet is clean as this tends to accumulate dirt. The foaming action of this product works wonders here and it really gets into all the nooks and crannies. The faucet can then be buffed to a shine with a microfiber cloth. Finally, clean countertops and mirror. 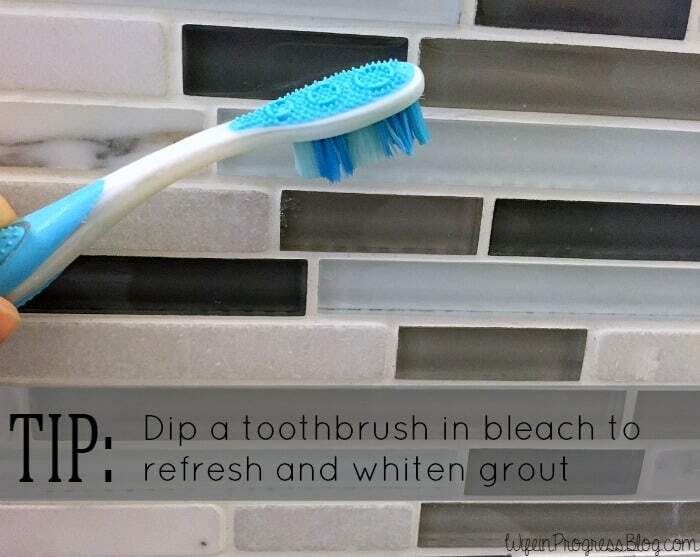 Grout: Dip an old toothbrush in bleach and scrub any discolored areas. Wipe down tile with the multi-surface cleaner. Floor: Wash with a mop or steam cleaner. Let dry. Return any removed items to the countertop and as well as freshly laundered towels and mat and shower curtains. Do you love to clean? Do you consider yourself quite the domestic goddess!?! I’d love to know what great tips you could share with me for other rooms in the home! We have a cleaner come every 2 weeks but it’s still good to do your own deep clean every now and then. Are you thinking of moving? I’m sure that’s the next time my house will be getting a deep clean! I think more people hire cleaners than I realized! Yes – we are planning on moving! I’ll be sharing all the deets on the blog very soon!! I am not a fan of deep cleaning. At all. That’s why I have someone do it for me. :) I love your tips, though! ha! I’m seriously considering hiring someone once a month to clean, actually! I really do hate it! !